Accrington Stanley Community Trust launched a brand new initiative in November 2017 aimed at getting businesses involved with supporting the charity. The ‘Friends of Accrington Stanley Community Trust’ scheme provides an ideal way for local businesses to engage its corporate social responsibility by supporting an organisation that improves health, social inclusion levels, as well as delivering sport and education programmes to over 15,000 local people. 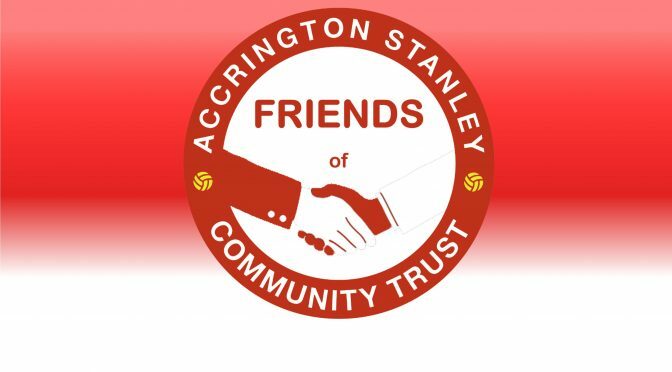 By donating or fundraising £1000 to Accrington Stanley Community Trust, organisations or individuals will receive a variety of benefits such as use of the ‘Friends of ASCT’ logo and advertising benefits such as social media coverage, website links and match day programme exposure. ASCT Chief Executive Officer, Martin Fearon said ‘We want to appeal to the local business community to support us in delivering some great projects in Hyndburn that really do make a difference to lots of people. This scheme is a great chance for businesses to give something back to the local community. All funds raised will go directly into delivering a number of community projects’. Working in the community is a proven way to improve your bottom line as its rewarding nature improves morale, employee engagement and recruitment and retention rates. However, we understand that setting up links and initiatives is difficult, with barriers, red tape and time constriction all playing a part in businesses choosing to opt out. As a Friend of Accrington Stanley Community Trust, we can take that hassle away. We have a wide range of projects ready and waiting for you and your employees to get involved with. Make a difference – become our Friend today! Article showcasing your companies support on our website. Your company logo on our website. Your company logo in our match day programme article. Listed as a partner in our end of year impact report. Access to Accrington Stanley player visits at your company. Invitations to ASCT Charity Events. Community Engagement and PR Opportunities. To find out more, or to become a friend of Accrington Stanley Community Trust, get in touch with Martin Fearon, on martin.fearon@stanleytrust.co.uk or call 01254 304071.